The Warriors stared the game in the ascendency with David McElhone running off half back and Muiris Bartley winning plenty of ball. Following a free kick for a high tackle Finn shot truly for the opening goal. Joseph Peni was heavily involved for the Mossies but he could do little to stop Finn as he took a huge contested mark from Pauric Smith’s pass. Finn scored his second major from the resulting kick and his third followed swiftly as he chased down and tackled a PNG defender. PNG started to gain a foot hold in the match as their dynamic ruckman John Ikupu began to have a huge influence. Crucially they managed to get on the score board at the death of the first quarter. Gregory Ekari found Jeconiah Peni who went back and kicked an excellent goal after the siren off a slight angle from 48 meters. Continuing their newly found momentum the Mossies kicked two behind to open the quarter with Pena Wingti outstanding off the half back flank. They found reward for their play when Archie Mai kicked the only goal of the quarter with an inspired left foot snap from the pocket following a ball up. The Irish only managed two behinds for the quarter as their forwards were starved of opportunities and the unforced errors began to mount. Lucey took a pack mark and found Padraig Fanning in acres of space. He steadied and shot from 40 meters only to see his shot sail just to the left for a minor score. However despite being under the cosh the Warriors took a narrow five point lead into the long break. The Warriors knew that they would have to lift their intensity and stick more tackles if they were to remain in front. This they did with renewed vigor but were unable to halt the waves of attack from the PNG army of runners. Ikupu’s influence was coming more pronounced as the Irish defense came under intense pressure. But for an outstanding display from Alan Farrell, who took several incept marks, and the excellent Brendan Browne PNG would have taken command. 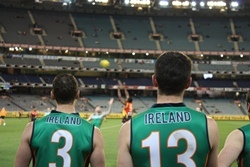 It was Ireland however who scored the first goal of the quarter. Lucey took another strong mark, played in field to Fanning who in turn found Sean Paul Henry in the pocket. He marked brilliantly and played on to kick a goal and give Ireland a 10 point advantage. PNG continued to threaten with Peni and Luke Savere controlling midfield. They edged back into the contest with another excellent snap from the boundary as a clean tap in the ruck from Ikupu to Gideon Simon resulted in a fine goal. Savere was at the heart of most of the Mossies go forward ball but the Irish held firm to take slender three point advantage into the final break. PNG got the critical first goal for the fourth quarter; Theo Gavuri, earned a free kick following a high fend off from Wayne Reilly, found Brendan Beno on the lead who slotted it through. With Farrell again reading the game superbly and Gerard Johnston to the fore, Ireland powered forward. Player coach David Stynes received a free kick and found Finn who crashed the pack to mark strongly. He proved his class once again to kick a vital goal from 45 meters to increase Ireland’s narrow advantage. PNG reacted by lifting their running game to new level, looking to play on at all times and use their pace to stretch the Irish defence. The Warriors hung on desperately as the Mossies continued to dominate possession. Ikubu was everywhere, winning the ruck contests despite giving up a height advantage and taking mark after mark across the field. Eventually the pressure told as Ikubu drifted forward to take a spectacular mark in from the side of a contest. He kicked it straight over the goal umpires head from 15 meters to see PNG take the lead for the first time with only 4 minutes on the clock. 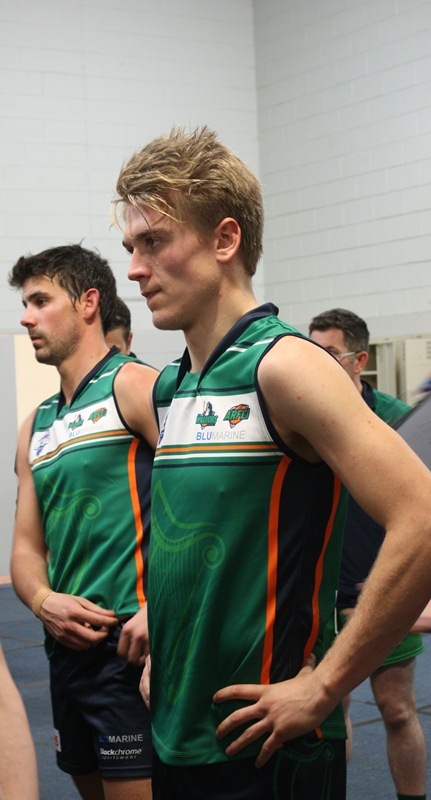 With Ireland pushing forward PNG's Scott Johnson found himself all alone with ball in hand. He picked out Beno who had his arms chopped, only 15 meters from goal. His simple goal brought the lead to 9 points which proved too much for the Irish despite Lucey’s late goal. Time ran out for the Warriors and the final siren provoked wild celebrations from the PNG players, staff and vocal supporters. Their superior running game and an ability to impose their game style on the opposition saw them run out worthy winners. Ikupu was deservedly awarded the medal for best on ground for his outstanding all round display. While the Warriors will no doubt be proud of their intensity and work rate, unforced errors, missed tackles and turnover ball proves costly as the growing pressure on the back line eventually told. With an average age of just 21 the fitness and work rate of the PNG side eventually told but they were pushed to the limit by the Warriors. The Irish were devastated at the climax but can feel immense pride having come so close to doing what no other country has managed, retain the International Cup. Note some discrepancies between the text and listed goalkickers as PNG rarely all wear the correct jumper. Ireland: Finn 4, Henry, Lucey.